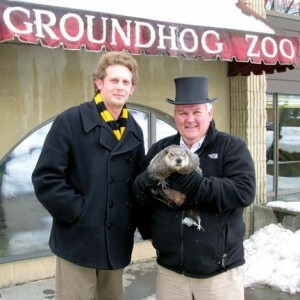 Punxsutawney Phil works only one day a year, but it’s enough to put his hometown on the map. “People know where Punxsutawney is, and it’s because of Groundhog Day,” says Tom Chapin ’96, the editor of the town’s daily, the Punxsutawney Spirit. For this Pennsylvania mining and factory town, Groundhog Day is the big day of the year. The town’s population increases fourfold. Local motels are filled. Cash registers ring. The newspaper prints extra copies and picks up extra advertising. A fireworks display lights up the midwinter night. News crews arrive from around the world. “Last year, I met a TV reporter from Russia,” Chapin says. There are lots of groundhogs, but Phil is special. He predicts when winter will end: if he sees his shadow, as he did this year, we’re in for six more weeks of winter. If he doesn’t, look for an early spring. The animal that inspires all of this lives a quiet life with three other groundhogs in the children’s section of the public library. On every day but one, his life is predictable: he eats and sleeps. But on the evening of February 1, Phil is taken out to Gobbler’s Knoll, a mile or so south of town, and put in a stump to spend the night in preparation for his next-day duties.